By now, you’ve probably heard about the new ban on telecommuting being implemented at Yahoo! The corporation’s latest CEO wants workers and teams to be side-by-side in an effort to improve employee communication and creativity. The change has obviously brought about strong negative feelings from employees and critics from outside the company because they feel it is a decrease in workplace flexibility. But, the simple fact that it is a change is also likely another cause of anxious feelings because something familiar is being phased out. Whether you work for yourself or for someone else, when policies and procedures change (especially ones that have been in effect for a long while), it can be difficult to adjust and do things differently. Even when the change is seemingly positive and welcomed, it will probably mean that you’ll need to learn and adjust to a new way of doing things. Rather than get thrown off track, start planning how you can successfully transition and incorporate new changes into your work life. You may want everything to stay exactly the same and hearing that there will be new policies and procedures can make you feel uncomfortable and unsure. Try to keep negative emotions under control so that you can strategically plan your next steps. If you’re freaking out, you’ll have a harder time crafting a plan of action. When you’re tempted to complain, pause and remind yourself that you are in control of your emotions and have the ability to see things in a positive light. Once you have all the pertinent information, you can plan how your new day-to-day work life will look and feel. Consider mapping out (or sketching) what your new day might look like. Do you need to travel to a new work location? Will you have new responsibilities? Consider uploading your plan (and any notes you have) to Evernote or record them in a paper journal so that can refer to it when you need to. Whatever the changes are, be sure that you have the tools needed to do your job well. Do you have the proper training to manage new responsibilities? Are you making use of technology tools (like reminder and project management apps)? With change, there are usually opportunities. They may not be as obvious at first, so take a minute to think through some of the positive things that may come about because of the change. Perhaps you will learn a new skill or get a chance to demonstrate your level of expertise more fully. If, like Yahoo! out-of-office employees, you will need to begin working from the company headquarters, it is possible you might strike up more fruitful partnerships with your colleagues. Being in the same location may change the dynamic of your working relationship, and you might find working alongside your coworkers in the same office will allow for greater creativity and collaboration. Keep in mind that there is often an upside to things that initially seem negative. Think things through fully to discover the positive impact that change may have for you. You know those mornings when taking a spoon out of a kitchen drawer is just way too much to ask of you? Sure, you somehow have enough energy to make a pot of coffee, get a coffee mug out of the cupboard, take the gallon of milk out of the refrigerator, pour both coffee and milk into your mug, and return the coffee caraffe to the coffeemaker and the milk to the refrigerator — but retrieving a spoon is the straw that breaks the camel’s back? Whoa, Nelly, NOT A SPOON! 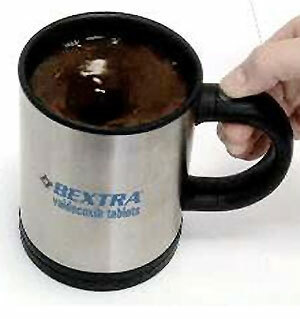 What cracks me up most about this unitasker is that it supposes you are too lazy to stir your beverage with a spoon, yet somehow not too lazy to hand wash the electric mug, which is a requirement. You’re also not too lazy to constantly keep it powered with two AAA batteries. I’m not sure the creators of this device really had their target market properly identified. Oh, and the fact that it doesn’t work with iced beverages is another strike against it. It’s sugar at the bottom of a glass of ice tea that bothers me more than any other mixed drink. Thanks to reader Donna for introducing us to this wonderful unitasker. Do you do a second pass on your uncluttering efforts to make sure that you didn’t accidentally leave clutter in your collections? If you haven’t been doing a second pass of the areas of your home and office you’ve uncluttered, I recommend you schedule it on your calendar for a few days or weeks after your first pass in your uncluttering process. My guess is you’ll find one or more items you’re now ready to purge from your bookshelves, or whatever area you’ve recently uncluttered. My wife uses her mini van as an office for her process serving business, and a shuttle bus for taking our children to and from various events plus all the household shopping. What suggestions or gadgets have you come across for organizing a vehicle? Any suggestions would be appreciated. Martha Stewart Living had an article in their September 2008 issue that highlighted the differences of all the CFL options. I’ve been working from my home office exclusively since 2009. In those four years, I’ve learned a lot about managing home and work life, staying productive while cozy at home, avoiding distractions, and more. Based on these experiences, the following are my ten tips that keep my work on track when I’m at home. Before I delve into my list, I should define “home worker.” It certainly includes telecommuters, freelancers, and those running a business from home, but that is not where the definition ends. Anyone who runs a household definitely works from home. Also, the number of people who spend 9–5 in an office, school, or at an off-site job, but then take additional tasks home to work on, is increasing. When I was young, I knew one family who had an “office” in their home, and I thought it was the oddest thing. Today, it’s pretty much the norm. Now that we’ve got that sorted, on with the tips. Have an emergency backup office. There will be times when the power is out or your internet connection is down. Or, perhaps, a construction crew is working on The World’s Loudest Project right outside your window. When this happens, you’ll need a backup site to go to. My default remote office is the public library. It’s clean, well-lit, quiet, and has free Wi-Fi. The employees don’t care how long I stay and there are electrical outlets everywhere. Good thing I travel light. Define a lightweight office-to-go. Figure out the bare minimum of tools you can get away with and remain productive. Something you can fling into a bag and go. Will your computer do? An iPad? A camera? Figuring this out ahead of time will save you a lot of aggravation when you need to vacate your home office pronto. Make your home office efficient but also pleasing. You’re going to spend a lot of time in your office, so make it a pleasant place to be. I have LEGO projects on my desk, Star Wars toys, and a pencil holder that my daughter made for me. Since I am at home, I need not comply to corporate decorating policies, and neither do you. Find things that you love and make you feel good and add a little style to your space. Adopt a system you trust. Unless you’re in business with your spouse, partner, or housemate, you likely don’t live with a co-worker or superior. That means that you are both the worker and the supervisor. Conquer the latter role by devising a system you trust. I follow David Allen’s Getting Things Done system and, in effect, that system is my supervisor. Trust is the critical factor here, as that’s the only way your brain will stop nagging about all of your undone tasks. Don’t be too informal. This one applies mostly to those who are earning their living from home. Since you are in the house, it’s easy to adopt a casual attitude about your day. In my experience, adding a bit of formality helps draw a line between work time and leisure time. I always shower, shave and put on nice clothes. I make a cup of tea and begin the day in the same routine one might in a traditional office. When I’m done with work for the day, I turn my computer off, kick off my shoes and join the family downstairs. That routine also helps me feel like I’m truly “off the clock” when the workday ends. Get your own inbox. This simple tip has vastly improved my marriage. My wife and I shared an “inbox” (an end table by the front door) for years and it made both of us crazy. My stuff mingled with hers, she liked to store things one way and I another. Now, I have an inbox on my desk and she has one on the end table. I process my inbox items on my schedule and according to my system, and my wife does the same her own way. I cannot recommend splitting this up strongly enough if you live with other people. Take Breaks.I alternate between work time and break time all day. A great Mac app called Breaktime lets me alternate between 25-minute work times and 5-minute breaks all day. This practice helps me maintain a productive streak and is also a luxury I wouldn’t have in an office. Take advantage of working from home. You work at home and that means you’re at home! Take advantage of this opportunity that many aren’t able to experience. Sit on the porch, eat lunch in your own kitchen, and never miss an event at your kid’s school. Be flexible. This lesson was the hardest for me to learn. I’d make a plan for my day, only to see it fall apart thanks to a sick kid, malfunctioning computer, flooding basement, and more. Understand this might happen, and don’t get too stressed when it does. Try again tomorrow. Stop for a moment. Think about your life as it is right now: the good, the not so good, and your work and personal stuff all blended together. Now add 20 children to that mix. Can you imagine how different your life would be? Your responsibilities would likely grow exponentially and you would need a lot of help along with solid systems to keep things from becoming overwhelming. Though this scenario might sound a little far-fetched, it was a reality for Johann Sebastian Bach who had 20 children. This fact was featured in an interview I read recently with David Allen, author of Making It All Work: Winning at the Game of Work and Business of Life and the best seller Getting Things Done. Another reason a lot of people are feeling overwhelmed is because people are not in true survival or crisis mode as often as they have been in much of our history. The interesting thing about crisis is that it actually produces a type of serenity. Why? Because in a crisis, people have to integrate all kinds of information that’s potentially relevant, they have to make decisions quickly, they have to then trust their intuitive judgment calls in the moment. They have to act … they’re very focused on some outcome, usually live–you know, survive. I think Allen might be on to something. When your choices are clear and it’s obvious which thing is the most important, you can make decisions more quickly and feel sure (not stressed) that you’ve selected the right option. But, do you really need to be in crisis mode to cope well when everything seems urgent and important? You likely do not (and will not) face some of the challenges others did in the 1700s, and it’s fair to assume that most of us don’t have to care for 20 children. That said, you will probably feel the pressure and strain of multiple competing priorities from time to time. What you experience may not fall in the crisis category, but even so, there are small steps you can take to fight off feelings of stress. You may need some time to think through the root cause of your anxious feelings, and, once you do, you’ll have these seven strategies to help you conquer them. Eliminate some projects. You might have taken on more projects than you could reasonably manage, or perhaps, they turned out to be more complex than you initially thought they would be. Look at all the things you’ve committed to doing and, when possible, remove the ones that are causing significant stress and/or delegate them to someone else. Re-structure your commitments. If your project is not something that can be easily delegated to someone else, think of ways to make adjustments that can make it more manageable. If there are deadlines, are they flexible? Can you switch roles (become a team member verses a project lead) or share the lead role with another person? Look for alternate ways to stay involved with less pressure. Keep a positive mindset. The next time you feel like your head is about to explode, remember that you don’t have 20 children! And, if by chance you do (or it feels like you do), try to keep an optimistic attitude. You might need a little help to refocus your energies in a more positive way, so whatever (or whomever) tends to cheer you up, go find them. Take a minute to make a list of things that make you happy and keep it close by for when those moments arise. Pace yourself. Do you ever notice that when you rush around, your brain sometimes does the same thing? You think you have to rush to get everything done, but the only thing that frantic pace does is make you move your feet a little faster. Instead, slow down a bit. You’ll be able to think more clearly and come up with a reasonable plan to manage your priorities for that day. Do nothing. Plan for days when you’ll relax and give yourself an opportunity to recharge. Taking breaks can help you to reduce stress and be more productive once you get back to your responsibilities. Be excellent, not perfect. Reaching for perfection will make it more difficult to remain stress-free. The notion of perfection is just that — a lofty idea, one that is impossible to attain. Trying to achieve perfection takes a lot of mental energy, wastes your time, and leaves you feeling unsatisfied. Excellence, however, can be achieved by anyone. Have a plan ready, strive to do your best, and put those notions of perfection aside. Stay healthy. The three things that you perhaps have the greatest control over are what you eat, how much you exercise, and how much sleep you get at night. Did you know that what you eat as well as the the amount of water you consume can affect your mood? The results of a recent study showed that even mild dehydration “dampened moods, increased fatigue, and led to headaches.” So, be sure to keep healthy snacks close by and stay hydrated throughout the day. There is no magic pill that will erase all stress from your life, but you’re not without tools to help you keep stress at bay. Test out some of the tips shared today to see how well they work for you. I didn’t even know Cauliflower Corers were a thing. More importantly, I never would have guessed what it was if it were sitting in front of me. Where I come from, tubes with sharp things on the end of them are used for digging holes for fence posts. The item, the Tweezerman Mascara Protector, is supposed to protect your face from getting mascara on it when you’re applying mascara. This is one of those instances when I don’t need to write a lot of text because the pictures speak volumes. I am incredibly impressed by how functional this multipurpose room is because of how well-organized Platetone has made it. There is so much to be garnered and inspired by in these photographs. Thank you, Platetone, for sharing your workspace with us. Services like Instapaper, Pocket and Readability are great for saving articles for later reading. But sometimes I want to read something right when I find it and, better yet, with a clutter-free layout like those services provide. This is when an in-browser reader like Apple’s Safari Reader, Instapaper’s Text Bookmarklet and Evernote’s Clearly come in handy. Apple introduced Safari Reader with Safari 5. Like the others, it offers a distraction-free reading experience by presenting an article without ads, sidebar images, headers or footers. 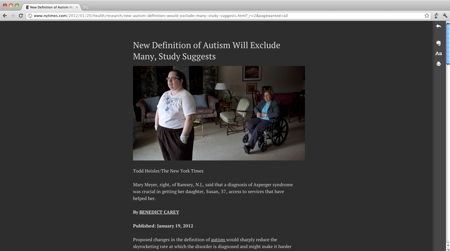 Instead, you get a center-aligned, black-on-white version of the article with any inline images intact. Plus, multi-page articles are displayed in one flow. That’s it. It works by first detecting an article or post on a web page. Once it has, a grey “Reader” button appears in the URL field in place of the RSS button. 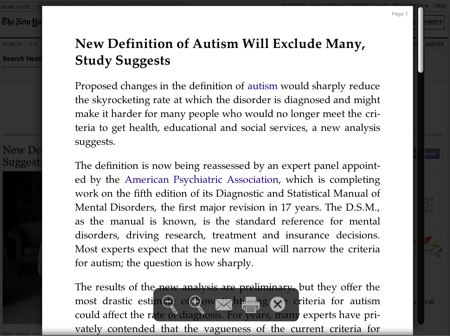 Click it to view your article in the Reader interface (Command-Shift-R works, too). The article appears on a white background in the center of Safari’s window. Also, the Reader button turns purple while the Reader view is active. Finally, a scrollbar on the right allows you to navigate the article. There are several tools available while Reader is active. Move your cursor toward the bottom of Safari’s window and the toolbar appears. From left to right, you’ll find “-” and “+” re-sizing buttons, as well as options to email or print the article. Lastly, a big “X” closes the Reader UI and restores the original website (clicking outside of Reader does the same). The best thing about Reader is that it works as advertised. The black text looks great and is highly legible. It loads quickly and lets you adjust the text size, print and share via email. Plus, it’s only available after a web page has fully loaded, so advertisers aren’t cheated out of impressions. 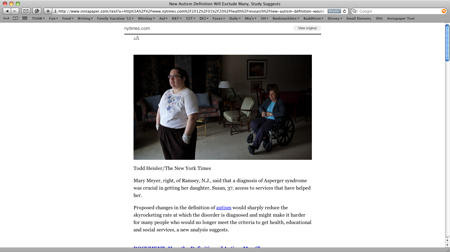 While Safari’s Reader for the Mac isn’t my favorite (more on that in a minute), it absolutely shines on mobile Safari. Especially on the iPhone. Typically I dislike long periods of reading on the iPhone because the screen and text is so small, but Reader fixes that. It commandeers the screen completely (unlike on the iPad, which still shows the toolbar and any open tabs), with big, legible text on a lightly textured background that just feels nice. An unobtrusive share button offers several options, like tweet, print, add to reading list and more. My main gripe is that Reader doesn’t fill the browser window. Instead, the original web page is seen behind the Reader presentation. Even though it’s grayed out, I’m still aware of it, which defeats the “distraction-free” aspect. In fact, it’s a deal-breaker. Sorry, Apple. Customization is also limited, though you can alter its look with a little work. It’s nice to re-size the type, but compared to others, it doesn’t do much. Finally, it’s restricted to Safari. Reader is nice on the Mac, super on the iPad, and, hands-down, fan-flipping-tastic on the iPhone. Instapaper offers a bookmarkelt that lets you read an article in the service’s text view without saving it to your collection of stories. It offers black text on white like with Apple’s Safari Reader, but with more options for customization. By default, the Instapaper Text Bookmarklet centers your text on a field of white. The customization tools are hidden until you click the font icon at the top left. Options include re-sizing the type, and I clicked the button 22 times and was obliged each time. You can also single- or double-space the text and adjust the column width. Again, it seems happy to stretch the text as wide as I like, easily filling my 24″ display. Finally, there are four fonts to choose from: Geneva, Times, Helvetica and Veranda. There’s no button to send to Instapaper, however. For that you’ll need a different bookmarkelt. Right off the bat I’m happy because it fills the browser window. Instapaper Text also offers more customization options than Apple. It also loads quickly, and is quite legible. Since it’s a bookmarklet, it’ll work in any browser and, like Safari’s reader, it displays multi-page articles on a single page. Can’t think of a one. I found this one recently and have been test driving it. Like the others, Clearly (formerly Readable) presents your target article without ads, a sidebar, header or footer. It’s an extension, not a bookmarkelt, and is available for Firefox and Google Chrome. Once it’s up and running, a click sends the article to your Evernote account. But, the single click action isn’t what I love most about it. If looks are everything, Clearly is a bombshell. The whole point of these things is to display an article so that it looks great and is pleasant to read. Clearly succeeds better than the rest. A click on the themes button on the right sidebar reveals multiple thematic options. By default there are three themes to choose from: Newsprint, Notable and Night Owl (pictured above). A fourth option lets you create a custom theme, with control over almost every aspect of how Clearly presents your pages. Finally, there’s a button to print the article and another to send it to Instapaper. It’s not available on Apple’s Safari browser. Evernote’s Clearly is my new favorite way to read articles without distraction in my browser. Yes, Instapaper is backed by a tremendous service that I love, but so is Clearly. Like I said, this is a beauty contest more than anything else and the team at Evernote has done a stellar job with Clearly. I’ll still send articles I wish to save to Instapaper, but will enjoy stories I want to read as I find them with Clearly. If your dog has a bad habit of eating sticks and suffering digestive issues afterward, I’m not sure a fake stick is a good alternative. Instead of eating bark, your dog would be eating stuffing, neoprene, neoprene fabric dye, thread — pretty much the equivalent of a SCUBA diver’s suit with fluff. Yummers. It’s an $11 fake stick! Egads. 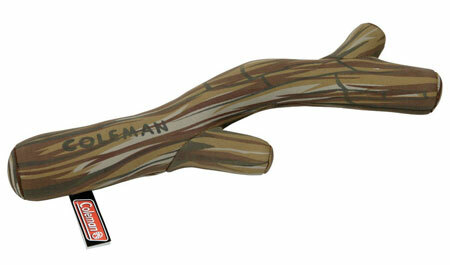 Thanks to reader Heidi for suggesting we feature fake sticks for pets — too funny. Daylight Saving Time in the United States begins on March 10. This is typically the time that people are not only advancing their clocks forward, but also likely thinking about spring cleaning. There are still several weeks before spring actually arrives, so this an oportune time to make plans for what chores you will do around your home. Priority areas. No matter how small your home may be, it’s very unlikely that you’ll be able to clean it all in one weekend. Start thinking about specific rooms (or appliances) that you’d like to work on first, and focus on one or two tasks per room. That doesn’t mean you can’t work on other things, you’ll just be giving your attention to the most important items first. For example, if something is broken and would need to be used often (like your heating and cooling system), it should go to the top of your list. And, of course, you should immediately take care of issues that prevent a room from being used safely. Specific cleaning days. To stay on top of all your cleaning tasks, try scheduling your spring cleaning activities on specific days and be realistic about how much time you’ll have to work on each area of your home. Use a checklist so you don’t forget to do something. It might also be a good idea to print your list and post it on the door of the room where you’ll be working. This will help you remember the things that still need to get done, and if you assign tasks to others, include names next to specific items so that they know what they’re responsible for. Cleaning supplies. Will you be making your own cleaning solutions or buying something already made? Do you need special cleaners for particular surfaces? Do you prefer green cleaners? Before you go shopping (or create you own special mixture), check your cabinets to see what you already have (check for cleaning cloths, too) and what you’ll need to acquire. Other tools and supplies. You may need to borrow, rent, or buy tools and equipment that you don’t use every day, like a ladder to reach high ceilings, long dusters to reach behind and under appliances, or air filters (be sure you have the right size). As you walk through each room, make notes of things you need to help you get the job done. There’s a wonderful discussion happening on the Unclutterer Forums. The topic: Building a new house. Quite honestly, it has me feeling a little envious. Building a custom home has got to be an exciting experience. At the same time, I suspect that it also can be a little overwhelming because there are so many things to consider and decisions to be made. The process can go smoothly and with fewer hiccups if you do a bit of planning ahead of time. A key step would be to get everything out of your head and to organize all the necessary information in an easy to use system. Start thinking about the home you presently live in. What seems to be working well? You’ll want to make sure those elements are present in your new home. What are some things that need to be improved upon? Do you have particular solutions in mind? Walk through each room in your current home and record the things that you would like to change. Once you’ve walked through each area in your home, you’ll have a better idea of the features that are most important to you. Create a list or chart of each room with the specific features you would like to have (hidden storage areas, extra outlets). Be specific about the things that you think would make each room function better based on your current lifestyle, and include any elements that you would find it difficult to live without. Your list will likely start out as a wish list and then get refined once you begin working with your contractor. Speaking of contractors, consider using a binder (with tabbed pages) or a digital notebook (like Evernote or Springpad) to keep track of builders and other professionals (architects, designers) that you want to contact or who have given you proposals. Your binder, digital notebook, or a website like Houzz.com is also a great place to keep track of your ideas. Be sure to also include a copy of your budget in your notebook. That way, you’ll be able to find it easily and see the budgeted dollar amounts as you think about features you want to include in your new home. It’s never too early to start preparing you current home for your departure. You will get a timeline for completion from the builders, so you can schedule time to unclutter your current space. Then, when it’s time to pack, you’ll only be handling the things that you will be taking with you. To help you stay on track, consider using a moving checklist. Building a custom home can be fun and managed without feelings of stress. With a solid plan and understanding of the process, you can successfully see your plans come to life. Keep in mind that you can always get more information before you make any final decisions. There are lots of articles (like 10 Things to Consider when Building a Home) and books (check out Building Your Own Home For Dummies) on building your home from scratch — as well as the mistakes to avoid — that can be great resources for you. If you were to build your dream home, what uncluttered features would you include in the space? It’s Valentine’s Day, and so a lot of people are focused on romance. But, what happens after the day is done? How do you keep focused on an important relationship when “things go back to normal?” A recent article in The Wall Street Journal suggests that finding the right (dare I say) balance between your work and personal lives can be difficult, particularly for entrepreneurs. When starting a business, managing a relationship with a significant other can be tough. Entrepreneurs often need to work long hours, weekends and holidays. They may have to travel unexpectedly and answer calls in the middle of the night. That kind of dedication — combined with the emotional highs and lows commonly associated with starting a business — can take a toll on an entrepreneur’s love life. The article goes on to say how frustrating it can be for those in relationships with entrepreneurs, particularly when their partners estimate that “a business task will take just a minute when in reality it takes a few hours.” Sound familiar? Of course, work-life challenges are not unique to business owners. The hectic nature of one’s job probably will not go away, but you do have some control over the frequency with which business tasks interrupt your personal time. Create and stick to some general rules of thumb that you find reasonable to follow, like putting away your cell phone while having dinner with your family or limiting business calls and emails while you’re on vacation. You can practice unplugging from your mobile phone by turning it off (or leaving it in another room) for short periods and then work your way up to longer time frames. It’s not very probable that you can completely turn off all thoughts about work. On the other hand, you can’t realistically spend every waking moment working. Set a reasonable schedule and consider creating blocks of time when you’re “on” and when you’re “off.” It’s also a good idea to test out the schedule that you come up with. Can you stop working at 6 pm, spend time with your significant other for two hours, and then continue working for another two hours? You’ll probably need to try out several scenarios before finding the one that works best for you. A calendar (digital or paper) can help keep close friends and family members up to date on times when you’ll be unavailable. If there’s an important project that will require quite a bit of your attention, the calendar is a great way to communicate that. That way, you’ll reduce the possibility of having personal events scheduled during times when your focus needs to primarily be on work tasks. You’ll also be able to pinpoint and block off the best opportunities for personal activities (vacations, daily personal time). Business owners sometimes get caught in the trap of doing everything themselves. Sure, there may be things that only the company owner can do. But, there are a myriad of other things that can be delegated either to a business partner, virtual assistant, or an intern. You can also use technology tools to streamline processes and automate some tasks. And, of course, there are a number of apps you can rely on to help you be productive once it’s time to get back to work.